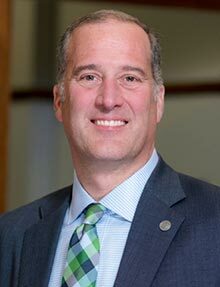 Brian J. Bruess, a 1990 graduate of St. Norbert, is only the second St. Norbert graduate to hold the position of president. The Rev. Dennis Burke, O. Praem., ’26 was the first. Bruess served in various leadership roles at St. Catherine University in St. Paul, Minnesota, before returning to St. Norbert. During his 21-year tenure at St. Kate’s, he was executive vice president and chief operating officer. Bruess was also responsible for multiple areas including enrollment management, student affairs, information technology, athletics, finance and administration. He built a reputation for a collaborative and innovative approach to planning and leadership; was the principal architect of efforts resulting in 15 consecutive years of record student enrollment; has an unrelenting focus on student learning, which resulted in strong student retention and increased diversity; and was instrumental in attaining and sustaining St. Kate’s financial strength. In 2006, he was invited to the Council of Independent Colleges Presidential Vocation and Institutional Mission program for prospective college presidents and, in 2010, was invited to the Association of Catholic Colleges and Universities Rome Seminar. Prior to his time at St. Kate’s, Bruess served in a variety of leadership roles at Ohio University in Athens, Ohio. Bruess has been honored for his contributions to higher education with the Minnesota College Personnel Association’s 2005 Lud Spolyar Distinguished Service Award and the 2002 Linda Schrempp Alberg Award. He received a bachelor of arts degree in sociology and psychology at St. Norbert College and both a master’s and a doctoral degree from Ohio University, Athens. Bruess and his wife, Carol, who is also a 1990 graduate of St. Norbert College, have two children: Tony and Gracie. Brian J. Bruess ’90 was inaugurated as the eighth president of St. Norbert College on Oct. 11, 2017.